You can create new constructs in MacVector by selecting two restriction enzyme sites, choosing Edit -> Copy, selecting a target restriction site in a different molecule and then choosing Edit -> Paste. It works great and fully understands compatible overhanging sticky ends preventing you from accidentally creating biologically impossible molecules. However, a far more flexible approach is to use the Cloning Clipboard. 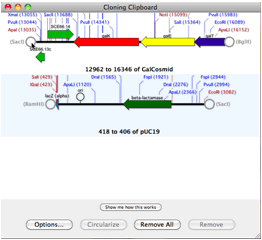 Select the restriction sites at the ends of your source molecule in the Map tab (hold down to select the second site), then click on the Digest toolbar button (or choose Edit -> Digest) and the fragment will be placed onto MacVector’s Cloning Clipboard. You can then join fragments together by simply clicking on an end and dragging it onto the end of a different fragment. Again, MacVector understands that the ends need to be compatible before they can be joined and even allows you to fill or cut back ends to make them compatible. You can join one end of a single molecule to the other to create a new circular molecule, or click on the Circularize button. You can also use this approach to create complex multi-step molecules generated by Gateway or Gibson cloning technologies. This entry was posted in Techniques, Tips and tagged cloning, restriction digests, weeklytip. Bookmark the permalink. Both comments and trackbacks are currently closed.